... has, since 1989, expanded the blasting furnace no. 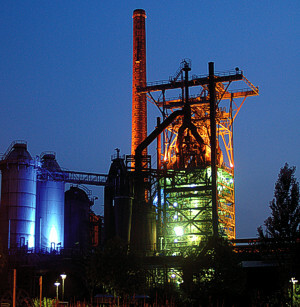 3 of Heinrich steelworks in Hattingen, together with its blasting hall, to one of the eight sites of the Westphalia Industrial Museum, administrated by the regional authority of Westphalia-Lippe (lwl). It forms one of the "anchors" of the "industrial culture route." Between 1854 and 1987, coke, iron and steel were produced, forged, rolled, poured and processed. Up to 10,000 people laboured in the foundry's operations. Technology, business, the social sector and ecology are the topics. The heavy industry work in the area of the "path of iron" is exemplified. On Sundays there is a special tour with a "Sunday stroll" (starting at 11:30), that leads through the huge ore and coal bunkers, past the powerhouse and hot blast stove, ending again at blasting furnace no. 3. The museum likewise offers: the "late shift," with an accompanying cultural program (Fridays, 7:00 pm). For children under 10, there is a "rat round" every Sunday at 2:30 pm, and older youth can participate every 2nd and 4th Sunday of the month in an eco-workshop. Adults 4 Euro, children and youth (aged 6 to 17) and students 1.50 Euro, reduced rates 1.60 Euro, family day passes 9 Euro. Groups starting at 16 persons: pro person 3.50 Euro. Groups starting at 16 persons: pro person 3.50 Euro.